Prior to getting engaged, I had a vision of my wedding. I want the reception to be fun, exciting and unique. I have planned my fair share of large corporate events. Prior to getting this ring on my finger, I swore the movie 27 dresses was written after my life story. With my background in event planning and "always the bridesmaid" experience, I know a thing or two about throwing a great party. We will not have a plated dinner at our reception. Instead, we will have multiple food stations, plenty filled with miniature sized portions of our favorite foods. One great thing about miniature portions is that you can add a miniature cocktail to pair with it. Mini grilled cheese paired with bloody mary gazpacho shooters, sliders paired with an mini boozy milkshake, mini hot dogs with gourmet toppings paired with a 3 oz pour of craft beer, miniature cuban sandwiches paired with a spiked cafe con leche. I could go on and on. Since we are getting married in New Orleans, my initial concept has changed to reflect Cajun cuisine. Prior to the destination wedding decision, we knew there was one must have item on our mini wedding menu - miniature Maine Lobster Rolls. I went to a tasting at Datz Tampa catered by Dazzle that actually had mini Maine Lobster Rolls on the menu. Not to fear, these will absolutely be incorporated at our engagement party. In my search for amazing miniature foods, I found an incredible caterer named Peter Callahan who has published the book Bite By Bite: 100 Stylish Little Plates You Can Make for Any Party . His artistic approach on catering is right up my alley. I couldn't write this post without sharing some of his amazing vision! (I am so ordering this book for our next dinner party). How talented is Peter Callahan? I mean, really....if the above wasn't enough, check out his signature mini entree course! How can one turn down a plate of food served with a mini patron bottle full of margarita (not to self, I must figure out how to get those at our wedding). I love the idea of mini-dishes so people can enjoy without feeling stuffed. Food is so important to ANY event but sadly, so many weddings have sub-par food. Really enjoying reading your planning process! How cute are those minis?!?! We had tasting stations with small plates at our wedding and it went over really well! People were able to get up and get the food when they wanted and pace themselves accordingly. We started the dance music pretty much straight away so if people wanted to get the party started they could....then go grab a bite to eat...etc. I had a lot of fun picking out what food we'd serve. Plus - it helps that when you do small plates like that most likely everyone will find something they enjoy! Definitely easy to please everyone in that case. Oh my goodness, Megan, you are a girl after my own heart. I wanted mini food at my wedding, but the buffet we are doing fits right in with the budget and we don't have extra to spare. I still think it's the greatest idea ever!! And I also need this man's book, amazing! Some of these ideas are SO awesome!!! I'm in love with the short rib sliders and bourbon as well as the crispy oysters and Bloody Mary...TOO cute...and yummy! 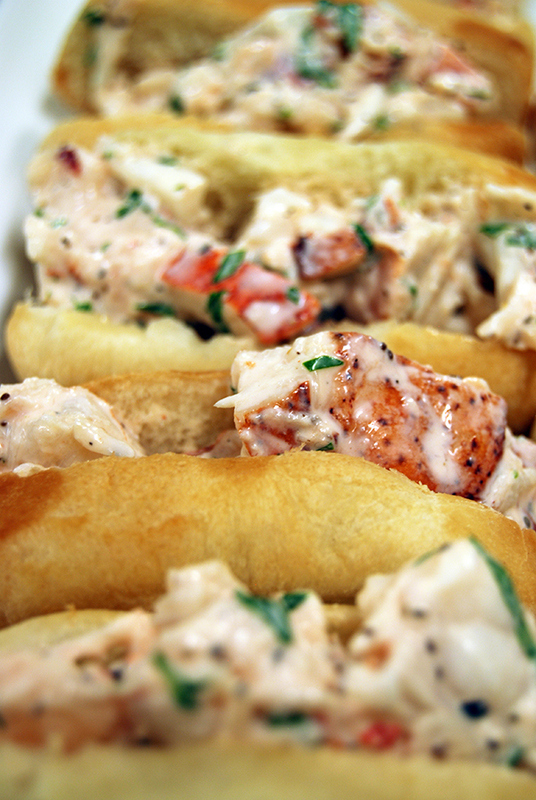 And of course, a mini lobster roll, how can you go wrong?? I was laughing at some of the others though..hilarious what they've come up with. And I agree with Katie, stations are a must at weddings. My friend had many grilled cheeses with tomato bisque shooters as a passed hor' dourve.I think I'll have to steal that idea but give it more of an Italian spin. But until I can start planning I'll be living vicariously though you!! !